There’s no magic formula to getting hired quickly. If you have the set of skills required to do a specific job, you are never too far from that job. However, taking a wrong approach or making some potential mistakes along the way can take you months before you get hired. It’s your job search strategy that makes all the difference. If you want to get hired quickly, you need to follow some important guidelines and abide by some practical tips. Before you start searching for jobs, you should become aware of the key skills and talents that you carry. Many jobseekers are completely unaware of what they will do best, what their potential strengths are and what their weaknesses are. Unless you know what skills come to you naturally and what strengths you possess, you can never expect to boost your job search. A career aptitude test, in this regard, does a great job. By taking one of these tests, you’ll quickly identify your strengths and weaknesses. Spend a few minutes on a career test and you’ll see the benefits. Once you know what your potential skills and strengths are, it’s time to identify your target job. Even when you have chosen a specific career to step into, you’ll find many different types of jobs to do. Before you start looking for jobs, you need to determine the kind of job you are looking for. What benefits should my job offer? How many hours do I want to work? What type of leave policy am I looking for? You can ask yourself many more questions like these. The point is to be crystal clear about the kind of job you are looking for. In any case, you should always make sure your expectations are realistic. One of the main reasons for the delay in getting hired is due to the wrong resume type selection. In today’s competitive job market, you should always focus on setting yourself apart from the competition quickly. Whether you are looking for a part-time job, a full-time job, or a work-from-home job; it’s important to choose a resume type that fits your situation the best. Find out whether you should write a skill-based resume, a chronological resume, a combination resume or a mini resume. A well-written cover letter also does an excellent job of standing you out in the crowd. Writing a cover letter is essential because it introduces you to the employer, showcases your key skills and makes it easy for the employer or the hiring manager to decide whether you are a good fit for the advertised job. Therefore, never forget to include a cover letter while applying for jobs. Not preparing yourself for the interview process is the biggest mistake you can ever commit during job search. Collect the list of commonly asked interview questions and right away and start practicing the interview with one of your family members or close friends. Whether it’s a phone interview, an in-person interview, or a panel interview; you should know how to ace them all. If you want to boost your job search to get hired for your dream job as quickly as possible, you should never forget to let your contacts know that you are looking for a job. Not all the job openings are posted to job boards or job websites. By networking properly, you’ll be able to gather useful information about vacancies and openings in a company. At the same time, continue to expand your network. Social media websites like Facebook, Twitter and LinkedIn make networking easier and fun. So, make sure you are using these platforms actively. How much you spend on your job search makes a lot of difference. What’s even more important is whether you are consistent with your efforts. You can’t search for a job once a week or twice a month. 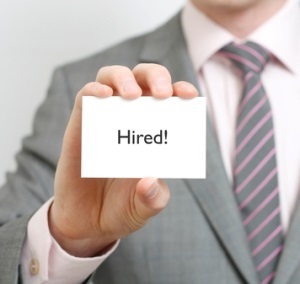 Until you get hired for the position you want, you should devote a few hours to the job search process every day. You need to persist until you achieve success. This entry was posted in Job Search and tagged get hired, hiring on September 12, 2013 by Carl Mueller.